Shade and Darkness - The Evening Before the Deluge, J.W.M. Turner, 1843. The dark sky and seething waters of the Biblical flood are swept into a swirling mass of blacks and purples, surrounding a pool of contasting yellow in the distance. Modern art is commonly associated with the 20th century. Yet, Joseph Mallord William Turner’s (1775-1851) work has characteristics that could be considered modern. 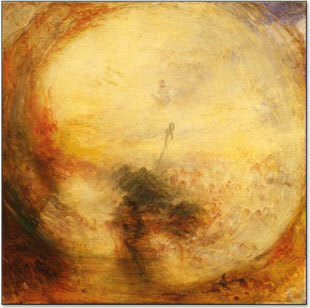 Parts of many of Turner’s paintings, such as the two here, show non-representational forms that depart from the dominant traditions of representation. Instead of trying to mimic the naturalistic appearance of the scene, some areas of the paintings appear almost abstract. Turner was a master colorist and was captivated by light and color. When, towards the end of his spectacular and prolific career, Turner was asked to explain the pair of paintings (at right) he was exhibiting at the Royal Academy in 1843, he tersely replied, “red, blue and yellow.” This triad comprised the painter’s traditional primaries. 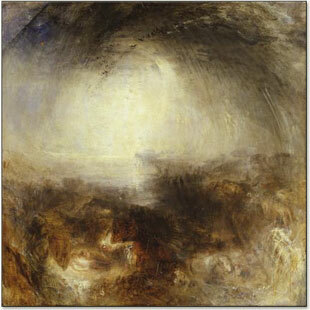 Looking at the swirling chaos in Turner’s vision of the Deluge’s aftermath, it is difficult to believe that it is founded on scientific ideas. Yet, Turner cites Goethe’s Theory, which he painstakingly studied once Eastlake’s translation was published in 1840. Here, he responds to Goethe’s “plus” and “minus” colors that address both the eyes and the emotions. 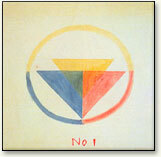 The “plus” colors of yellow and red-yellow excite lively feelings, while blues impart gloomy and melancholy emotions, or “the impression of cold.” To Goethe, as Turner, yellow was above all associated with the sun and energy-giving qualities. Turner accompanies the first of the two paintings, Shade and Darkness - the Evening Before the Deluge, with verses from Fallacies of Hope, alluding to the line, “The moon put forth her sign of woe, unheeded.” The colors are, as we would expect, dark and low-key (Goethe’s “minus”) as opposed to the bright colors (including much yellow) of the aftermath of the Deluge. Nevertheless, Turner never believed in following any theory to the letter; rather, he interpreted it as he saw fit. This is very different from, for example, Monet’s more objective scientific view of the color theories from Goethe, Chevreul and other writers. Beginning in 1907, Turner gives lectures at the Royal Academy on color and perspective. Having been named “Professor Perspective,” he remains a loyal supporter of the Academy throughout his life. He is intrigued by the anti-Newtonian doctrines expounded in Goethe’s Farbenlehre in 1810 that proposed that there are three core colors, not seven as Newton found. However, Turner feels that even Goethe had underappreciated the constructive role of darkness in the generation of color. 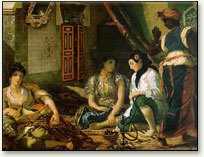 Women of Algiers in their Apartment, Eugène Delacroix, 1834. Delacroix explored the effects of contrast, and is said to have remarked, “Give me the mud of the streets and I will turn it into the lucious flesh of a woman”… if you allow me to surround it as I please. Turner seeks to capture on canvas the luminosity of the most complex scenes — light as reflected from water, or seen through rain, steam or fog. How does he do it? Among other techniques, he utilizes the difference between the additive and subtractive mixing of colors. In many paintings, Turner strategically places small dots of colors so the additive mixture would gain brilliance — 50 years before the Pointillists. Meanwhile, in France, Eugène Delacroix is making imaginative use of color and color contrast, as in the picture shown at left. Delacroix is influenced by Goethe. Delacroix is influenced strongly by Turner’s paintings and even travels to England to visit him, although Turner was away on a trip. It was through Delacroix that the Impressionists were introduced to ideas of color contrast, including simultaneous contrast.